Easily incorporate photos or scanned images with your Design. Simply drop the photo on your EazyDraw drawing, then resize or crop as needed. Orient text on curves or angles with the "annotation" capability of EazyDraw. Fully typeset your oriented text, all of your Mac's advanced type layout capability may be used to properly space and tweak the appearance of your titles. Use precisely positioned guide lines, lines curves or circles. You can design with the proper units for your production needs (cm, inches, points, etc.). The guides may be hair-lines, dashed,or appropriately colored. 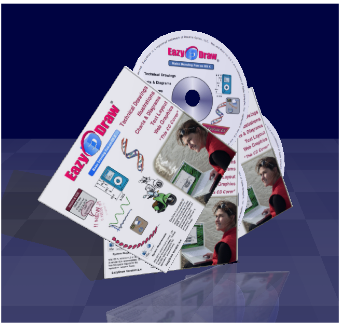 You may print directly from EazyDraw to your home CD printing method. OS X's technology foundations assures that any capability supported by your printer can be used with EazyDraw. Or export as EPS or PDF for use by a professional publisher, these formats provide the highest quality graphics with reasonable file sizes and are normally preferred by electronic publishers. The Page Setup user interface is configured dynamically from information supplied by your printer. Incorporate photos, scanned images, or generic clip art with your vector drawing. EazyDraw provides a wide selection of tools to design with these "clips" and make them an integral part of your drawing. EazyDraw's text interface supports a wide selection of text styling techniques, stroke, outline, hard and soft shadows. Typeset text may be converted to Bezier curves for individual character design and precise positioning and aspect adjustment. EazyDraw download is 80 Meg, for Mojave and High Sierra, see support page for other solutions.